February is AMD Awareness Month What is AMD & Why must we be aware of it? AMD, or ARMD, is Age-Related Macular Degeneration - it is a medical condition which affects older adults. It results in vision loss due to deterioration in the macula, which is the central part of the retina responsible for sharp focus and color vision. AMD is a major cause of blindness in people over 60 years of age. Dry or Atrophic AMD refers to retinal deterioration without leakage of fluid or blood into the retinal tissue. In dry AMD, there is a thinning or breakdown of the layer of pigment cells which lies behind and supports the light sensitive photoreceptor cells that are critical to vision. Often, accumulations of debris called DRUSEN are also present. These changes lead to color vision changes and central vision loss which is typically slow but can be significant over time. About 90% of people affected by AMD have the dry type only, while about 10% will progress to wet AMD. There is currently no treatment available for dry AMD, but your eye doctor might recommend certain vitamins which may slow its progression. Wet or Exudative AMD affects about 10% of people who have AMD. With this type, breaks in the membrane behind the retina develop and abnormal new blood vessels grow through these breaks. These abnormal vessels can leak and bleed into the retina, causing vision loss due to swelling and/or scarring. This damage often results in rapid vision loss. Fortunately there are treatments available for wet AMD which can be helpful if applied early. These treatments are aimed at sealing off the leaky blood vessels with a laser or preventing new abnormal blood vessel formation and leakage by the use of medication injected into the eye. There is no pain associated with AMD. So it is important to get your eyes examined regularly with dilation of your pupils. This is the only way to diagnose AMD. There is a tool that your doctor can give you to continue to monitor your central vision at home. Ask for an Amsler Grid - it is a simple piece of paper with a square grid to assist in the detection of degenerative changes that may be occuring. AMD is a disease we routinely screen for during a dilated eye exam. When you come in for your next exam at Milwaukee Eye Care Associates, feel free to ask your Doctor about any possible signs of AMD. 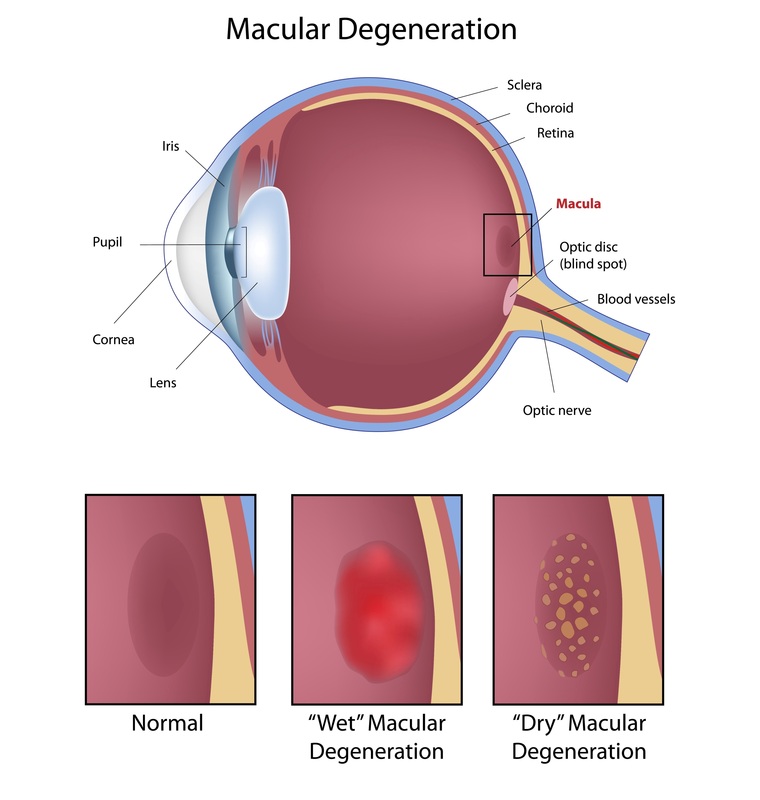 Stay tuned for additional information about Macular Degeneration!